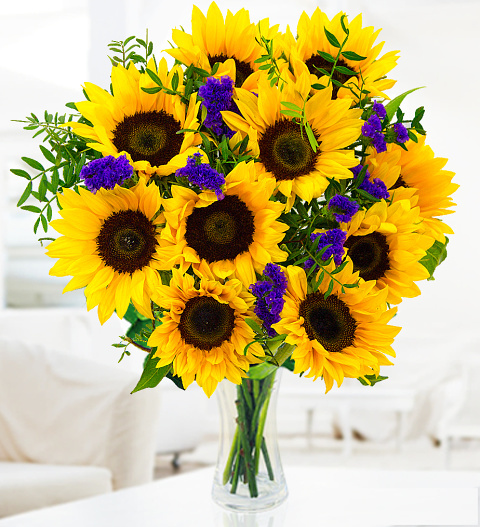 Sunflowers are known for their brightly coloured petals and large blooms. When you send flowers like these, you can be sure that they will fill any room, and recipient, with joy! Each stem of Dutch sunflowers, statice and pistacia is carefully arranged to perfection by our professional florists. Ideal for birthdays, to honour achievements, celebrate the arrival of a new baby, and any other occasion. This cheerful flower arrangement is also available for UK next day delivery! Chocolates may contain nuts.